Effects also have the ability to make you sound better than you actually did. For example, you can add harmony parts to your lead or backup vocals, or you can make your guitar sound like you played it through a number of great amplifiers. All effects have presets. Presets are factory settings that enable you to dive right into using the effects processor without having to know how each parameter works. Presets are a good place to start when you’re not really sure how to get the sound that you want. Most presets are named, and the name may give you a hint about where you may use it. For example, a reverb with a preset called vocal plate lets you know that it may be worth trying on vocals. After you choose a preset, don’t be afraid to tweak it a little to get the sound you’re after. The best way to discover how to use effects on your music is to experiment. The more you play around with the different settings, the more familiar you’ll become with how each effect operates. Then you can get creative and come up with the best ways of using effects for your music. The Bypass button on your effects processor is your friend. With a press of this button, you can quickly turn off the effect to your signal. Use it to check your effect settings against your original signal. Sometimes you’ll like the original sound better. 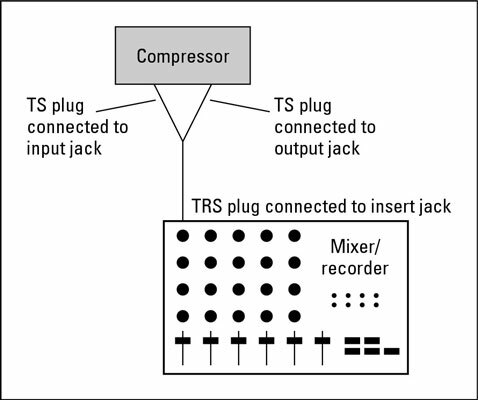 For an effects processor to work on your sound source, you need to connect the processor properly. Regardless of the type of signal processor or recording system you’re using, you have the option of connecting your processor directly into the channel strip (called a line or insert effect) or routing it through your aux bus (a send/return effect). Insert (line) effects are placed in the signal path so that all of the instrument’s sound passes through the effect, as shown in the following illustration. Line effects alter the entire signal of the instrument and don’t allow you to mix the amount of effect that you have with the original dry (unaffected) signal at the mixer. Line effects are generally dynamics processors like compression or gates, which are great for evening out signal levels and getting rid of noise on your tracks, but they can also be the useful new effects, such as amp or microphone simulators, that are available to the home recordist. Insert effects go in the signal path and affect the entire sound of the instrument. Send/return effects, such as reverb, delay, chorus, and flange, allow you to mix both the affected and unaffected sound separately. 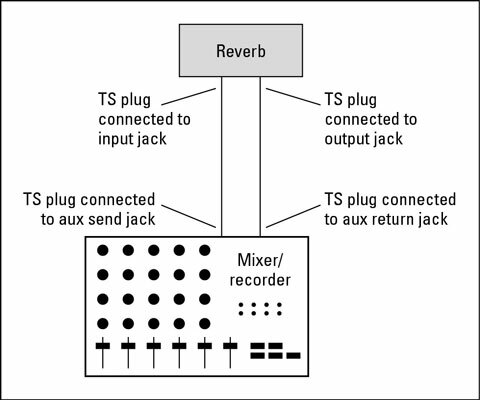 The send/return effect is connected to the aux bus in your mixer (through the aux jack), as shown in the following, and as a result, you can adjust both the dry signal and the affected signal separately. Run as many instruments through the same processor as you want. For example, you can have your snare drum, kick drum, bass guitar, and backup vocals all run through the same reverb. Have as much or as little of the affected sound in your music as you want. This can be an advantage if you want just a little reverb on your vocal track, for instance. Pan the dry signal to one side of the mix and the affected signal to the other side. This can add depth to an instrument and can be used for a variety of cool effects. A send/return effect allows you to have both affected and unaffected signals.